It was my pleasure to accompany my friend and father-in-law Alfred Heller to Milan. I am an expo tyro, so I benefited greatly by seeing the expo world through Alf’s experienced eyes. 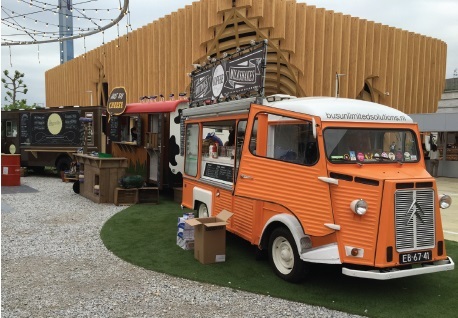 We visited the expo in mid-May 2015. I went again with my wife, Anne, and our college-age daughters in mid-July, so this piece is based on my longitudinal expo-sure. 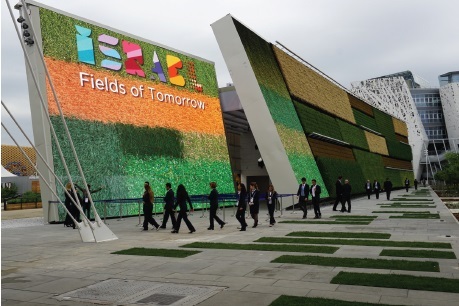 Expo Milano 2015 was a big tent, literally. The covered Decumano colonnade was nearly a mile long, so the shade was welcome. The Expo’s theme was a big tent, too. “Feeding the Planet: Energy for Life” had room for McDonalds, Coca-Cola, factory farming, and alcohol. 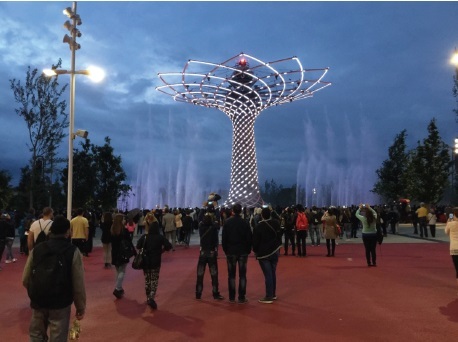 It also had working gardens, hydroponic demonstrations, and the largest (fake) tree in Italy. Like the other first world expos I have attended (Aichi, Japan in 2005 and Zaragoza, Spain in 2008), the Expo Milano site was not easy to reach. These cities needed to build a large site from scratch and it looks as if the Milan site resulted from a combination of urban renewal, transit realignment, and swamp draining. we took a taxi to the remote south entrance (Merlata). The gate was also served by subways, buses, and parking shuttles. Once we entered the expo grounds, we used the perimeter bus to get from place to place. The stops were situated in inconvenient spots but they saved walking and, if we got seats, standing. The buses ran frequently on a clockwise route around the site, kind of like the train at Disneyland. The people in charge of integrating the food theme into the expo design did a reasonable job. 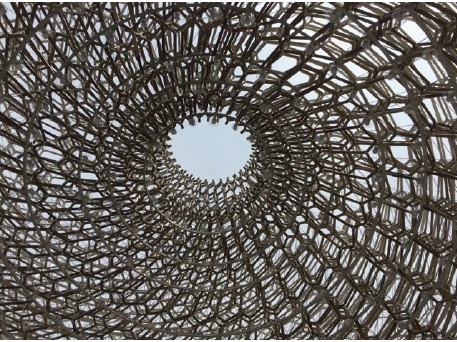 There was much to learn about global food systems, and the countries, NGOs and corporations participating in Expo Milano directly or indirectly addressed the theme. They tooted other horns, too, like mineral resources, energy, and tchotchkes. Many pavilions—surprise!—also sold food. Bottom of the food chain—countries consigned to (or consumed by) Food Group Clusters (e.g., Tanzania): I visited Tanzania a few years ago and wanted to see its pavilion in Milan. Tanzania was one of several countries from Asia, Africa, and Oceania that made up the Spices cluster. The United Republic of Tanzania had free run of a small square room. The walls were covered with photos, maps, and posters. The rest of the room was devoted to handcrafts and other Tanzania products, all for sale. A single employee was on hand to sell these souvenirs and staff the aromatic coffee bar. The food chain’s second link consisted of detached, single-country pavilions on a small, apparently non-corporate scale (e.g., Turkmenistan, Bahrain): Lots of products from Turkmenistan, huge carpets hung tapestry style, and a library of vital Turkmen texts were featured in the high, airy main room. The pavilion also paid due respect to the personage of Gurbanguly Berdimuhammedow, the country’s president who made a bold, spontaneous bid to host the 2022 expo. 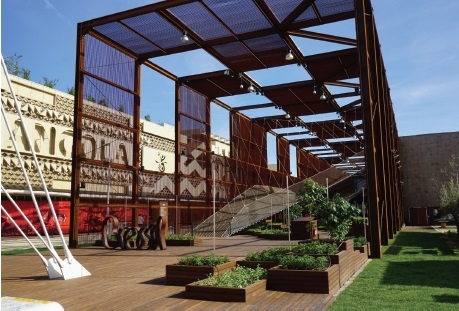 Bahrain’s pavilion featured authentic flora and antiquities of this island kingdom in the Persian Gulf. The building looked like my image of a hotel in Palm Springs, another desert oasis with more money than water. A fourth category of pavilion showcased the sponsoring country, an innovative concept or two, and arresting architecture. The examples here are Russia, the United States, Kuwait, and Austria. Russia had an interesting exhibit on food science and technology and a show kitchen where visitors could watch food preparation and eat the result (thick borscht during our visit). Alf and I also went to the café for some fine Russian red ale and sat in a booth in a simulated rail car. The Russian countryside rolled by “outside” the train on large video screens. The United States pavilion, “American Food 2.0,” had living walls on the outside and a spacious inside designed “to evoke the lines of a traditional American barn.” It had the types of multimedia displays offered by other pavilions and a penthouse bar/nightclub with great views and occasional live music. 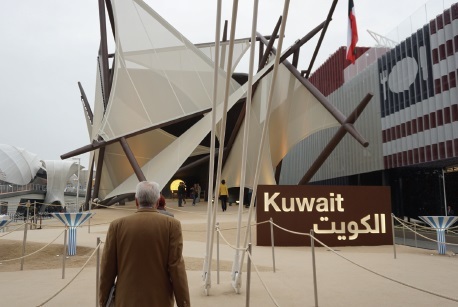 Kuwait had a multimedia meditation on desert agriculture, water and oil, and interactive displays on the country’s culture and history. Austria was all about oxygen—the kind you BR-EAT-HE (the pavilion’s principal motif) and the kind made by the many plants growing in the botanical garden inside. Special viewing devices gave information about the plants and a welcome cloud of mist watered the flora and human fauna inside. At the top of the food chain were pavilions full of vision, artistry and the “Feeding the Planet” theme (e.g., Brazil, China, Japan): Brazil had actual farming taking place along an open-air colonnade, partially shaded by panels made of wooden slats and a wavy, supposedly walkable expanse of stretched hemp mesh. Inside the pavilion were agricultural displays, an eatery, expensive clothes and crafts, and—during the early weeks of the Expo run—a fabulous art exhibit, “Alimentário,” on farming and the politics of food and hunger in Brazil. China and Japan, recent hosts of expos of their own, offered pavilions that were both conceptual and comprehensive. China’s “Wheat Field of Hope” diverted visitors snaking from the educational displays on the first level to the exhibits upstairs. Each station in Japan’s pavilion doubled as a staging area for the next event, culminating in a virtual, interactive “meal” and an elaborate display of plastic food. Finally, there was a large, well-stocked grocery store near the Roserio gate. For the hundreds of expo employees and anyone else needing staples, it was a thoughtful and practical way to emphasize the food theme. If you don’t like the food chain metaphor, perhaps you should think of expos as plants that only bloom—or bear fruit—every few years. The flowers and fruits might differ over time, so it is worthwhile to see more than one example. Smell the flowers, taste the fruit, and make reservations soon for Expo 2017 in Astana, Kazakhstan. The theme for 2017, “Future Energy,” reminds us that we ought to start stoking up now.